One of the most popular Android applications ever offered is SwiftKey. The third party virtual QWERTY keyboard is the number one selling app in 38 countries with more than 1.5 million units sold. Version 3.1 of the app has just arrived at the Google Play Store and includes a new Berry theme. It also offers support for a number of new languages like Armenian, Azerbaijani, Georgian, Hindi, Hinglish, Irish, Macedonian, Spanish (Latin America) and Tagalog. Remember the split keyboard that debuted for the Apple iPad with iOS 5? By splitting the QWERTY in half and putting each half near the edge of the screen, you can type more easily with your two thumbs. This is a new feature that is available for regular sized devices with SwiftKey 3.1. The update also brings improved language pack downloads. There is also an improvement in key layouts on some keyboards. And lastly, some issues that shut down the app have been addressed. The amazing thing about SwiftKey is how it allows even the sloppiest typist to send perfectly typed messages. If you've never seen SwiftKey in action, check the video below. There also is an version of SwiftKey for tablets. SwiftKey is on sale for $1.99, a 50% discount for the holidays, although you can download a free 30 day trial from the Google Play Store. Yes! 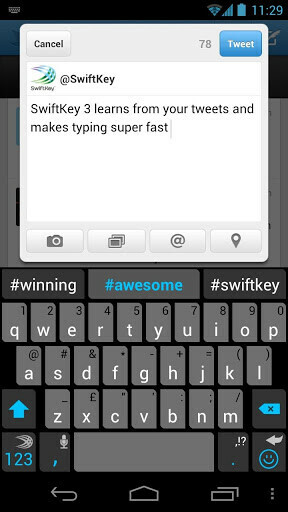 Love swiftkey. Looking forward to more themes and updates. Alright ! Swiftkey is really the best keyboard app I've ever used ! This should really be offered FREE. 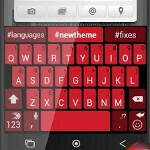 Ever since using the 4.2 android keyboard, I dont see a reason to buy this anymore...just being honest. Have used it for a couple of versions;. Love it EXCEPT for the fact it does not play nice with my also favored dolphin browser on the GS3. Painful when surfing... otherwise yes it is awesome at word prediction.